The statues are made from blocks of quartzite sandstone which was quarried at el-Gabal el-Ahmar (near modern-day Cairo) and transported 675 km (420 mi) overland to Thebes. 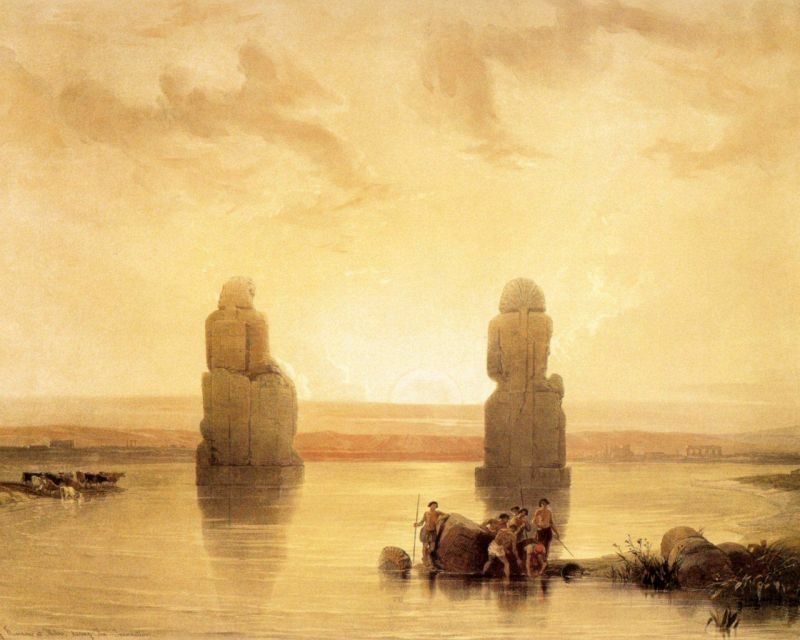 (They are too heavy to have been transported upstream on the Nile.) 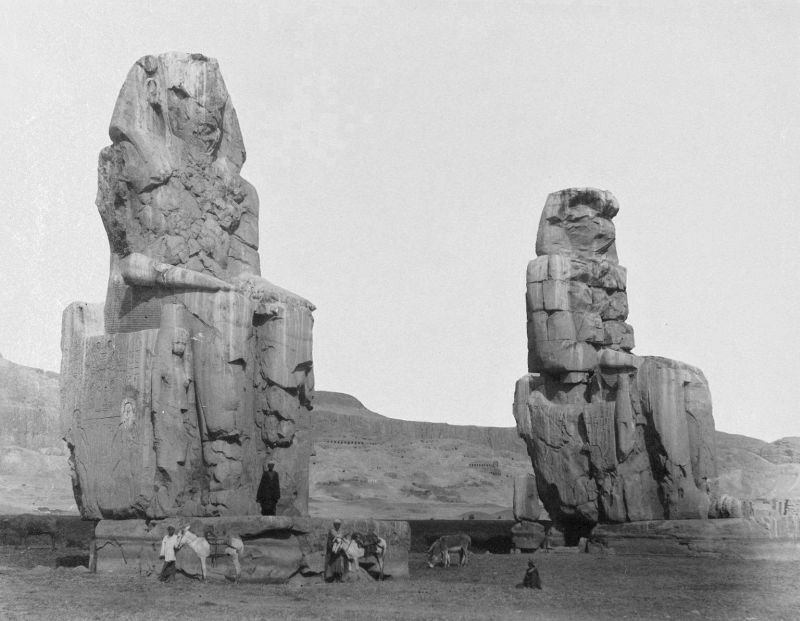 The blocks used by later Roman engineers to reconstruct the northern colossus may have come from Edfu (north of Aswan). Including the stone platforms on which they stand – themselves about 4 m (13 ft) – the colossi reach a towering 18 m (60 ft) in height and weigh an estimated 720 tons each. The two figures are about 15 m (50 ft) apart. 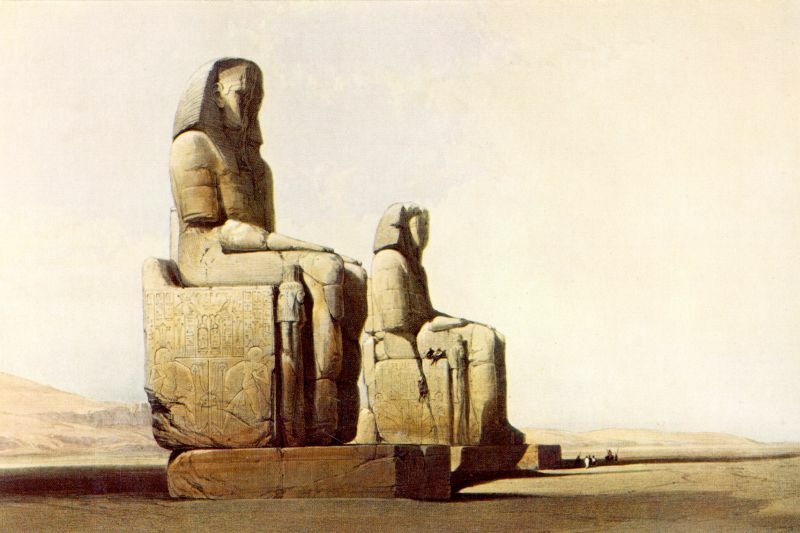 The original function of the Colossi was to stand guard at the entrance to Amenhotep’s memorial temple (or mortuary temple): a massive construct built during the pharaoh’s lifetime, where he was worshipped as a god-on-earth both before and after his departure from this world. In its day, this temple complex was the largest and most opulent in Egypt. 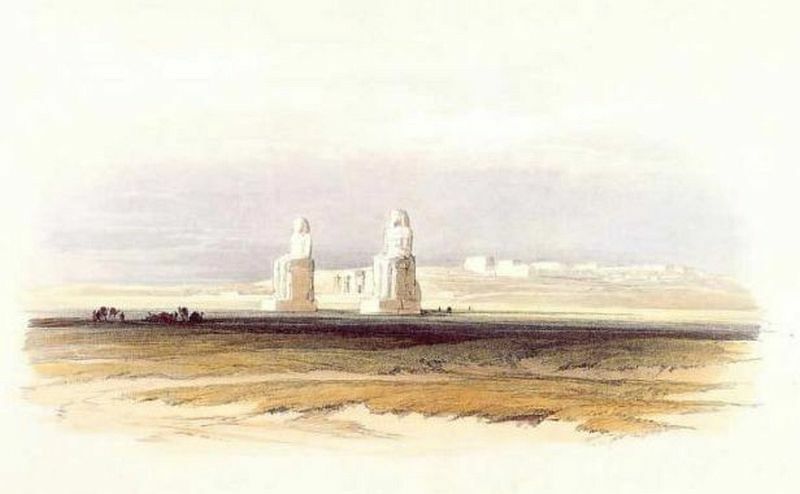 Covering a total of 35 hectares (86 acres), even later rivals such as Ramesses II’s Ramesseum or Ramesses III’s Medinet Habu were unable to match it in area; even the Temple of Karnak, as it stood in Amenhotep’s time, was smaller. Memnon was a hero of the Trojan War, a King of Ethiopia who led his armies from Africa into Asia Minor to help defend the beleaguered city but was ultimately slain by Achilles. The name Memnon means “Son of the Dawn”, and was probably applied to the colossi because of the reported cry at dawn of one of the statues (see below). 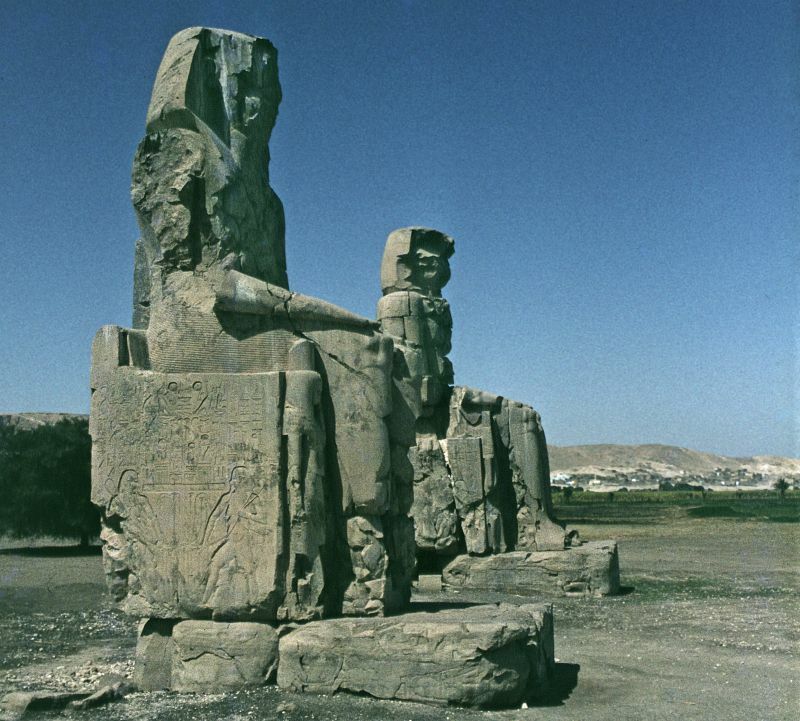 Eventually, the entire Theban Necropolis became generally referred to as the Memnonium making him “Ruler of the west” as in the case of the god Osiris who was called chief of the west . 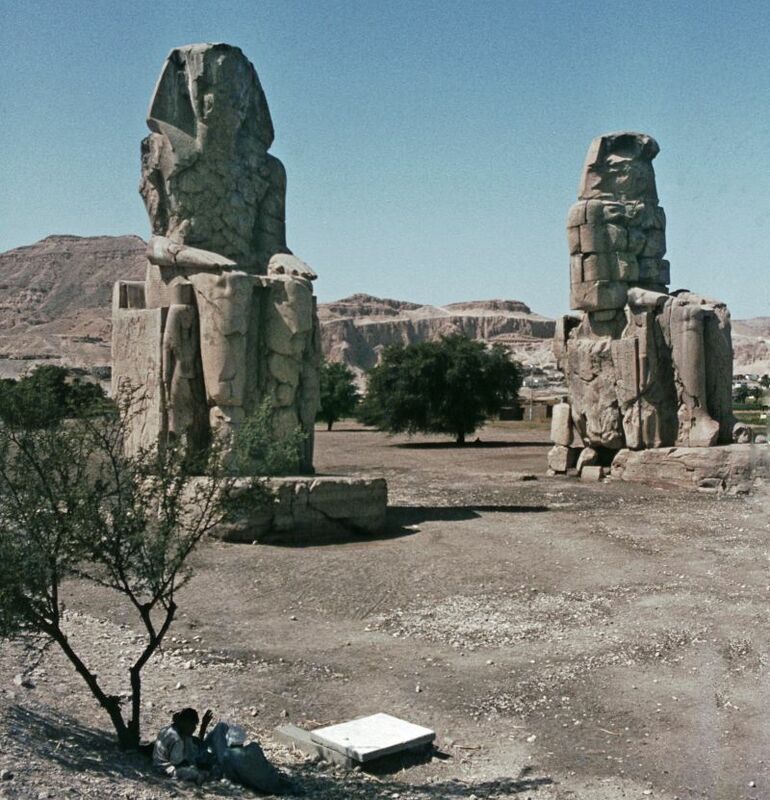 Memnon was said to be the son of Eos; the goddess of dawn.